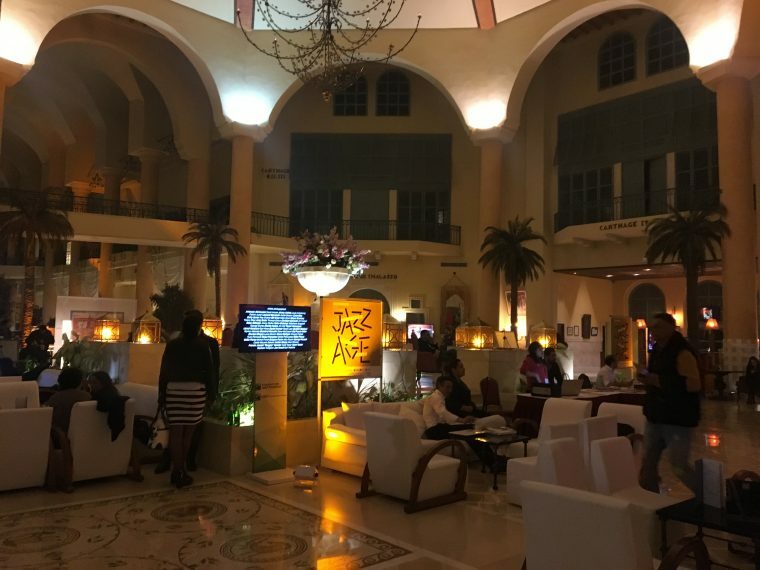 I was very excited to be offered the opportunity to attend the popular Jazz á Carthage festival in Tunis, with the added benefit of experiencing the Tunisian cuisine, the sights and wealth of culture that this fabulous country has to offer. Tunisia has had an undeservedly rough time of it of late, in the aftermath of the tragic 2015 terrorist attacks; their tourist industry has been absolutely devastated. I have to admit, I was initially nervous about travelling there. However, my mind was quickly put at rest when I saw just how seriously the Tunisian authorities take the safety of their visitors and residents alike and how they have put in place every sort of precaution possible. Just to enter our hotel we had to walk through scanners, plus armed police were very visible at all major venues. 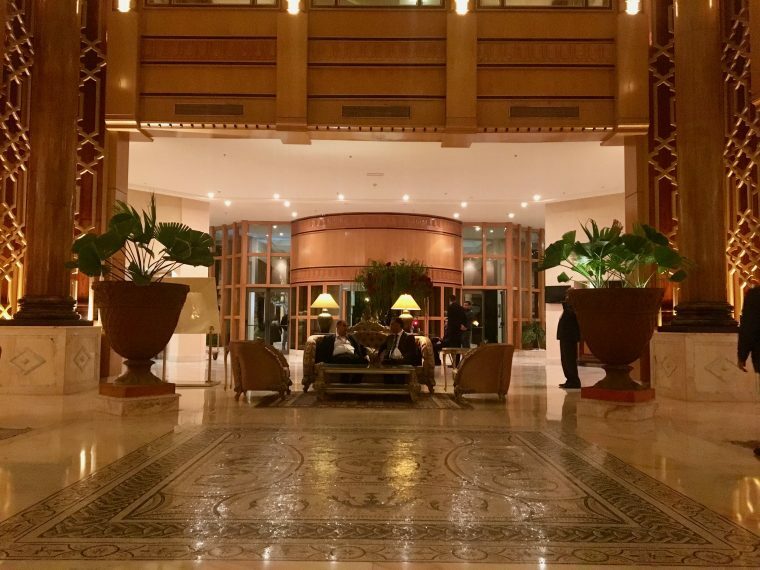 As it transpired, the whole of the Libyan government had descended on our hotel to meet with the Tunisian Heads of State. I felt very safe at all times during my visit and wouldn’t hesitate to return again. 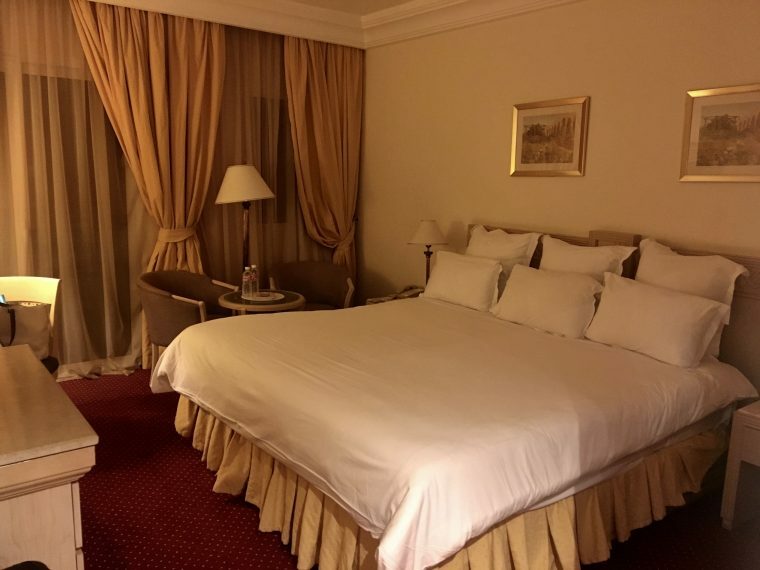 I was staying at The Regency Hotel, a 5-star luxury hotel, which seemed to cater predominantly for corporate guests and events, at least during my stay. I was struck on arrival by its elegant and rather regal foyer. The wooden and stone pillars created a great sense of grandeur in the palatial lobby which had a large domed ceiling, expansive marble mosaic floors, giant plants in huge urns and embroidered sofas in tones of blush pink and sage green, creating a feeling of opulence. My room was traditionally furnished in golds and reds and had the most enormous, comfortable bed that would fit a whole family, let alone little me! 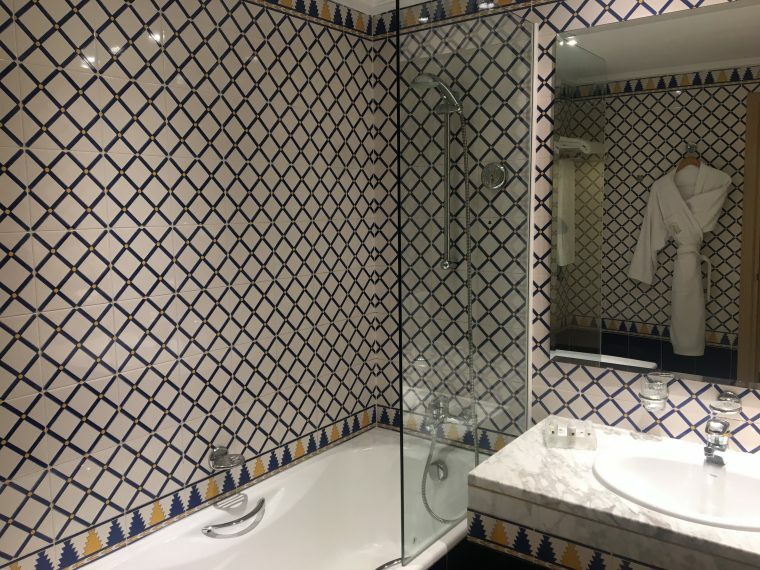 The bathroom was artfully tiled in classic Tunisian style and my balcony had a good view overlooking the coast. There are two luxurious swimming pools in the garden area, both surrounded by palm trees. The weather was warm and sunny, but March is not high season in Tunisia, therefore only the smaller pool was open for use. Dinner on our first evening was a buffet in the hotel dining room. There was a delicious selection of grilled meats, fish and a fine array of salads and freshly made flatbreads. 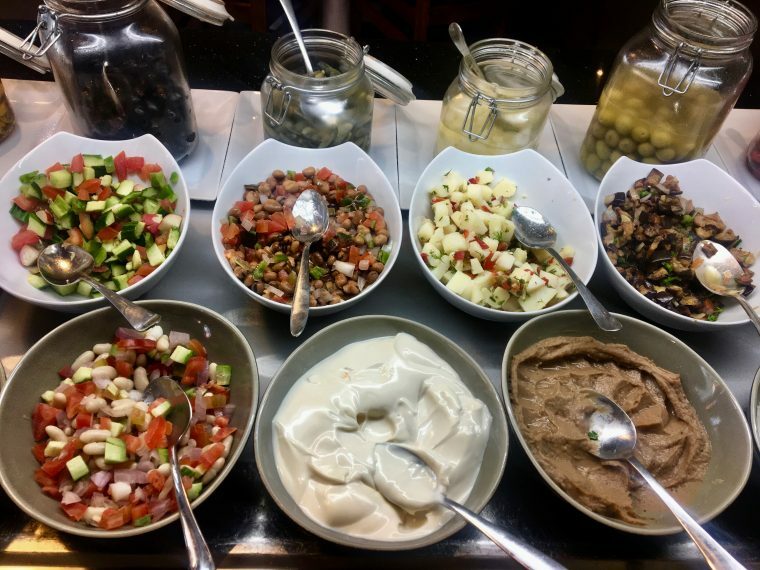 The Tunisian salads are varied are absolutely delicious, they use a lot of aubergines, cucumber, peppers and tomatoes, plus egg, tuna and cheese are a staple in their cuisine. Moncef our charming guide, highly recommended the Tunisian wines, and over the period of my stay I tried a few and I was very impressed. We drank the Blanc Magnifique, which was a delicious, crisp, full flavoured white wine, which complemented my grilled chicken and salads. There are also three other restaurants in the hotel, a traditional Tunisian one, an Italian and a Thai. We ate at the excellent Thai restaurant on two evenings, as it was open late after we arrived back from the Jazz á Carthage festival. Breakfast has to be one of my favourite meals when I’m travelling, as unlike when I’m at home, rushing out the door, it is a leisurely meal to be savoured. 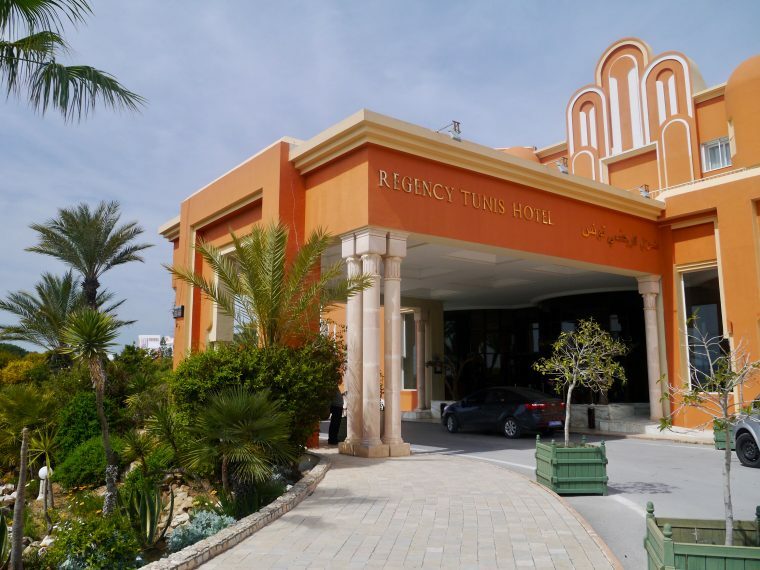 The hotel had the most unbelievable range of delicious foods on offer, hot dishes, eggs to order, Tunisian flatbread, salads, fruit, cheeses and plenty of sweet treats. I drank gallons of their freshly squeezed orange juice (which you can find in abundance and buy very cheaply everywhere you go) washed down with black coffee and I just couldn’t resist the most mouth-watering, delicious Tunisian dish called Omali. 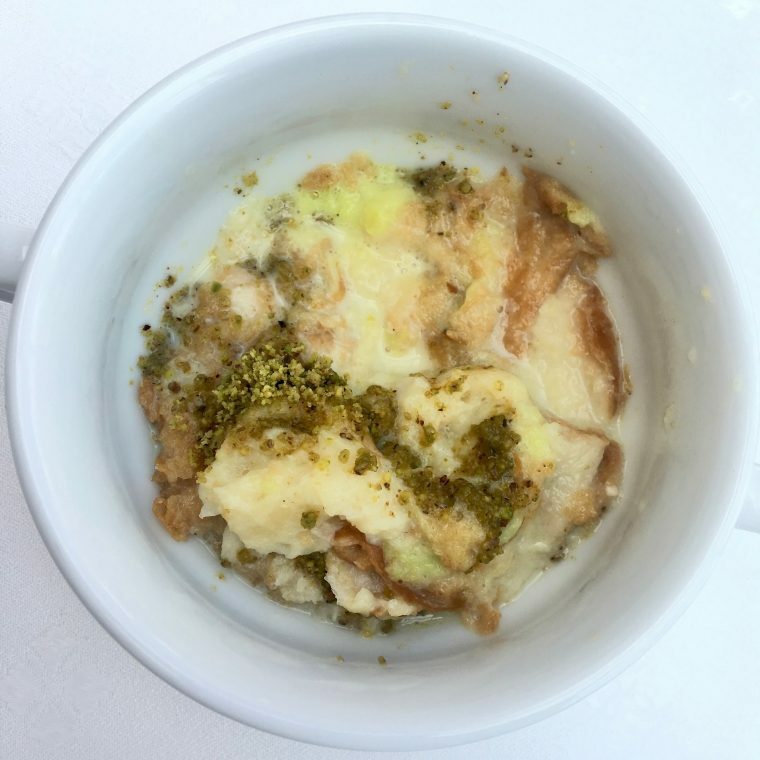 It is made with croissants in a sweet milky sauce, with a pistachio crumble topping, I can honestly say I will never want anything else for breakfast ever again. It must be the ultimate Tunisian childhood comfort food. 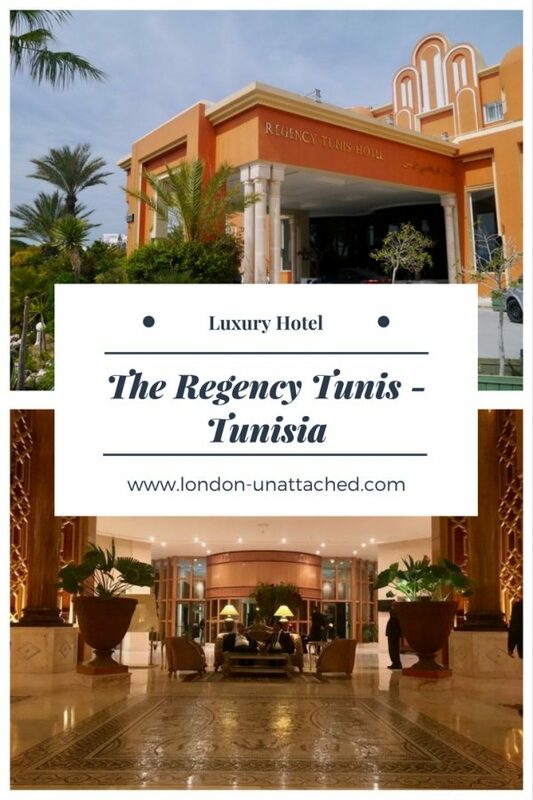 Now as much as the Regency met all our needs, and provided a very luxurious and comfortable stay, if I was visiting Tunis with friends or family, I might prefer to stay in a hotel a little less corporate and with cafes and restaurants in the local vicinity. Just north of Tunis, set on a hillside, overlooking the Mediterranean Sea is the most beautiful town of Sidi Bou Said, (which I will talk more about in my next post). Whilst we were there, we visited a stunning boutique hotel, called Dar Saïd, the destination of rock stars and artists. 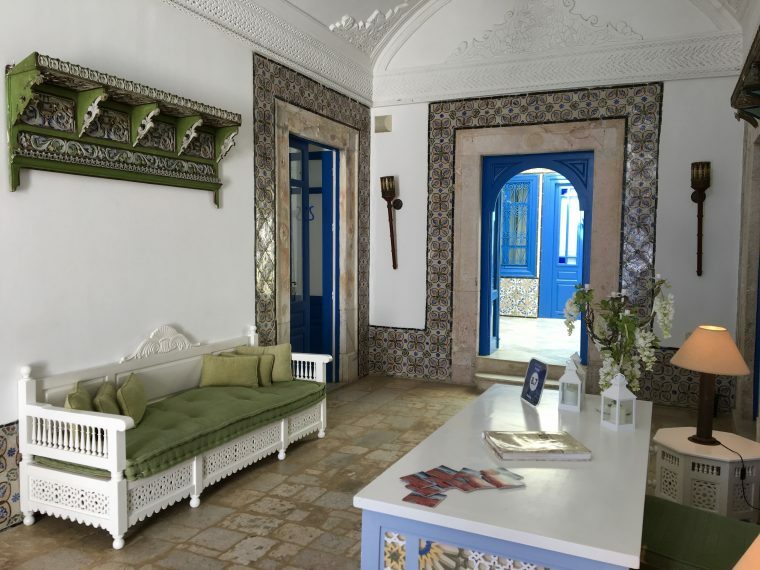 You can see why – with its unique, effortlessly cool rustic charm, all in the spirit of the XIXth century’s bourgeoisie of Tunis. This enchanting hotel will undoubtedly be on my hit list for future visits. 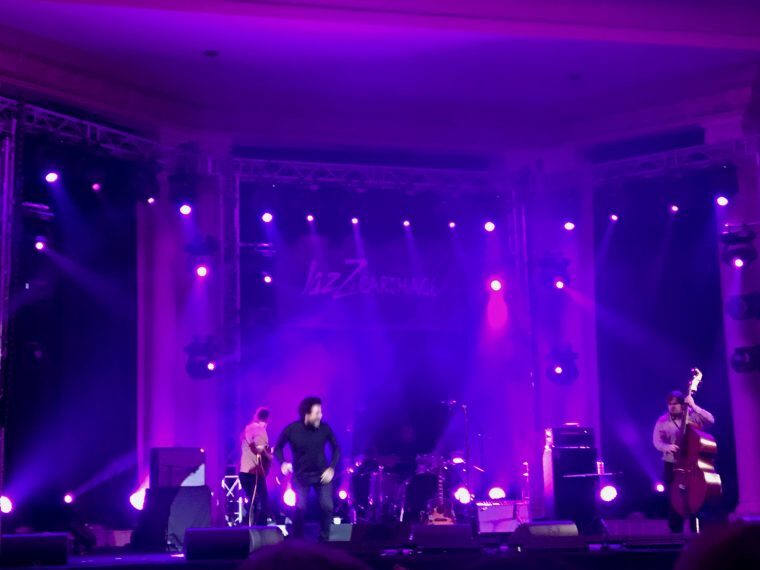 One of the main purposes of my trip was to attend the Jazz á Carthage festival. The name suggests that this festival is all about Jazz music; however, the acts I saw over the 3 nights I attended couldn’t possibly be described as Jazz in the traditional sense. 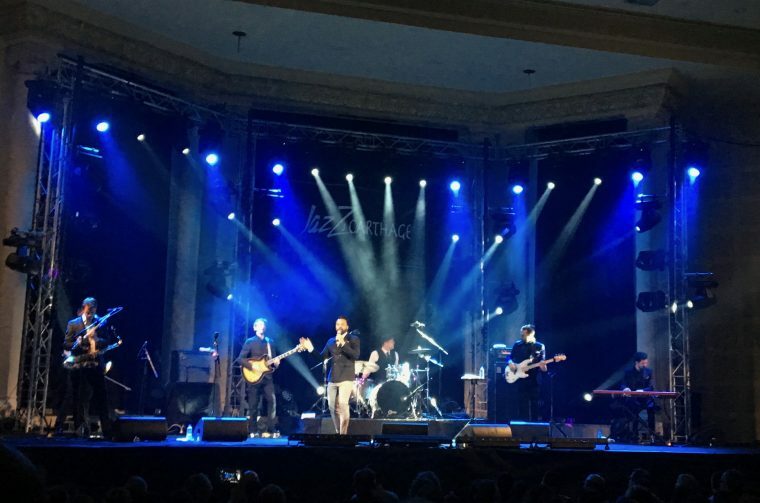 Soul, R & B or Jazz funk perhaps, but Jazz, no… I presume that 12 years ago when this festival first started it set out to host Jazz bands, but over the years the music has evolved and it now houses a broader mix of musical talent. The concerts were held in the rather grand Carthage Thalassa Hotel, not far from where we were staying. The venue is seated, which I never think lends itself to the true spirit of music concerts, as it restricts and inhibits the audience a little. 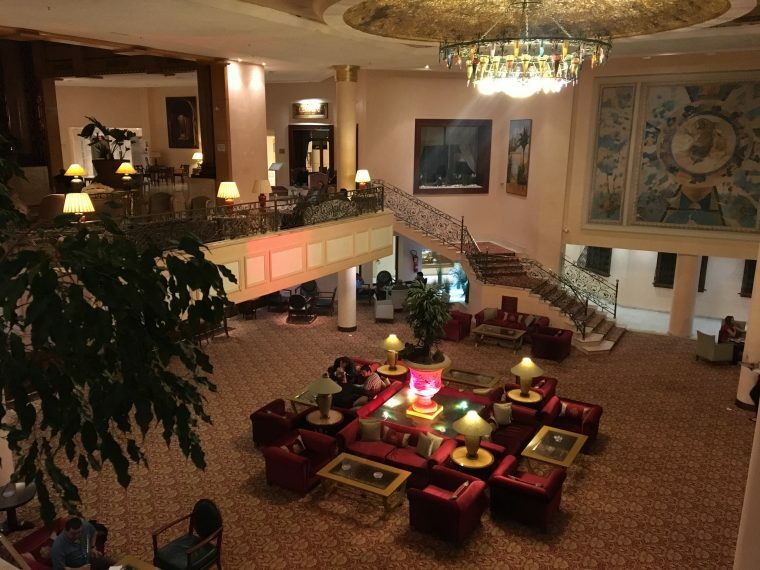 Drinks were served in the magnificent main lobby of the hotel or outside but were not permitted in the venue itself. The Jazz Festival is an international event, hosting artists from all over the world, including some from the UK. The first night, successful UK artist Liam Bailey opened the show. Liam has a strong charismatic presence and slightly rugged charm. His beautifully soulful voice has a raw expressiveness about it, which I loved. His music is very much in the R&B /soul genre. He played a great set of melodic and uplifting songs, along with some quite rocky numbers, which have definitely made a lasting impression on me. I particularly loved ‘Stun’ and ‘It’s not the same’. On next was Myles Sanko, dressed in a white shirt and smart blazer; he came across as a bit of a smooth operator. His sound has a jazz funk feel to it, and his voice is velvety smooth and soulful. 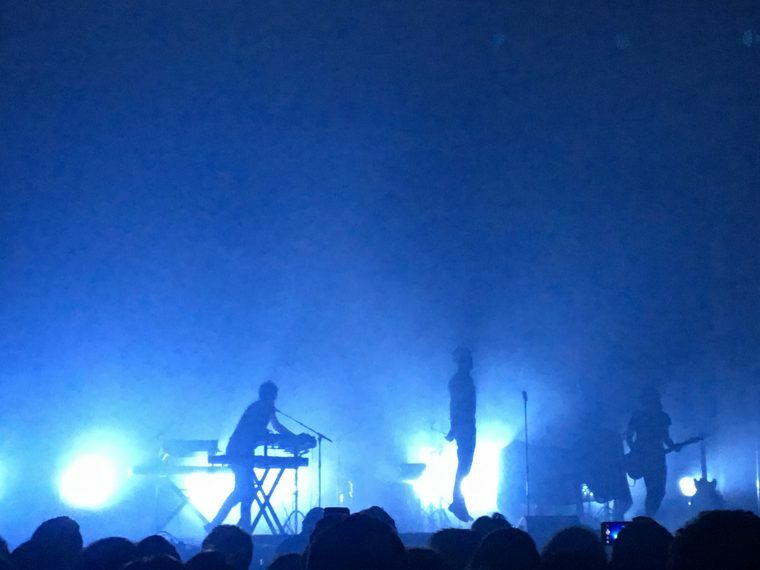 They are a large, accomplished, rhythmic band with a fabulous brass section, flute and keyboards, and they played some soaring piano and guitar solos, and the audience seemed to be really lapping it up. There was much more of a concert feel to the second night, perhaps because of the young audience. First on was the four-piece band, Aaron from France. They came on in a sea of dry ice and some very dramatic, atmospheric well choreographed coloured lighting. The crowd was enthusiastic and the band appeared to have a large, young fan base present. Aaron have an Indie rock feel, along with some interesting synth keyboard and drums, some of the set had a very 80’s sound. The charismatic front man charmed the audience telling us all ‘habibi’ which means you are my lover in Arabic, this pleased the crowd no end. My main problem was that the venue is very tightly seated with little room to move around, this band really needed its audience up and dancing with a beer in hand, had that been the case, I would have happily joined in. 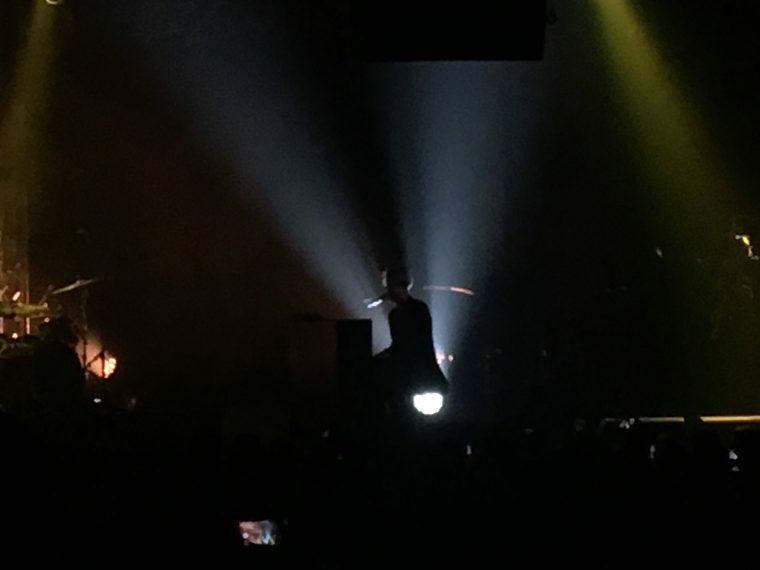 Tom Odell headlined night 2, his piano was set centre stage, initially on an almost completely dark set apart from a single dramatic spotlight on him. From the outset, he captured the heart of the audience. His powerful rousing vocals, pounding jazzy piano and soulful sounds were very intoxicating. Regardless of the space restrictions, the audience felt impelled to get up, people stood on seats and spilt into the aisles, this was more like it! However, due Tom’s late start and previous pick up arrangements, our group had to leave the venue early. I was incredibly disappointed to have to go, as I was absolutely mesmerised by his set. I am determined at the next possible opportunity to go and see him again. On my last evening of the festival, a Palestinian band called 47 Soul were on first, they were quite fun and funky, with lots of percussion and a real Middle Eastern sound and had everyone up and dancing. Next was Wust El Balad from Egypt, they opened on a long guitar solo. They had every conceivable instrument, including an oudi, accordion and a vast selection of bongos. It was an eclectic mix of music from the classic, very echoing Middle Eastern sounds through to a bit of rap! Not really my cup of tea. I really appreciated the chance to see such a diverse mix of musical talent under one roof. There were a further 9 more days of the festival to go, with bands from all over the world playing. Most I admit I have not heard of. But, from my experience of the first few days – what a wonderful way to bring together world music. Please follow my ongoing Tunisian adventure in my next post. This sounds wonderful and rather reassuring as I know many people are worried about visiting Tunisia at present. This looks fabulous. I’m not so mobile now, so I think it being all seated would be great! I love, love, love Jazz. It makes me feel happy and it can make me feel calm. I was in Casablanca when I heard about the attacks and it’s a real shame. I really hope the keep putting together events like this. The hotels looks amazing and the food even better. With all of these great food choices, how did you decide what to indulge in? Looks like this five star hotel is a winner. Lots of pools, entertainment, cozy bedding and more. It’s really nice to see a positive post about Tunisia, I’m really looking forward to visiting at some stage, and I agree that the press it’s had recently has been unfortunate. Everything I’ve heard from travelers who have been is that it’s an incredible destination. Thanks for letting me know about the Jazz á Carthage festival – just another reason to visit! Love that there is such a diverse range of international artists – I would love to spend 9 days enjoying each of their sets!